The American Society for Clinical Pharmacology and Therapeutics (ASCPT) re-launched Clinical and Translational Science (CTS) as an online-only, open access journal in January 2016. 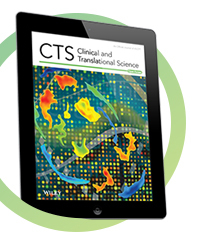 CTS is the first peer-reviewed, interdisciplinary journal that helps bridge laboratory discovery with the diagnosis and treatment of human disease to improve human health. CTS is issuing a formal call for papers for quality, scientifically sound original manuscripts focused on clinical pharmacology and translational science, including animal, in vitro, in silico and clinical studies supporting the breadth of drug discovery, development, regulation and clinical use of drugs. CTS will consider articles, commentaries, phase forward (clinical trials) and reviews. Review the CTS Guide to Authors. Contact the editorial office at cpt@ascpt.org.